Biography*: Charles I, Roi de France also went by the nick-name of Charles 'the Bald'. He gained the title of Roi Charles I de France in 840. He succeeded to the title of Emperor Charles II of the Holy Roman Empire in 875. He was crowned Holy Roman Emperor in 875. He was born on 13 June 823 in Frankfurt, when his elder brothers were already adults and had been assigned their own regna, or subkingdoms, by their father. The attempts made by Louis the Pious to assign Charles a subkingdom, first Alemannia and then the country between the Meuse and the Pyrenees (in 832, after the rising of Pepin I of Aquitaine) were unsuccessful. The numerous reconciliations with the rebellious Lothair and Pepin, as well as their brother Louis the German, King of Bavaria, made Charles's share in Aquitaine and Italy only temporary, but his father did not give up and made Charles the heir of the entire land which was once Gaul and would eventually be France. At a diet near Crémieux in 837, Louis the Pious bade the nobles do homage to Charles as his heir. This led to the final rising of his sons against him. Pepin of Aquitaine died in 838, whereupon Charles at last received that kingdom, although Pepin's son Pepin II would be a perpetual thorn in his side. The death of the emperor in 840 led to the outbreak of war between his sons. Charles allied himself with his brother Louis the German to resist the pretensions of the new emperor Lothair I, and the two allies defeated Lothair at the Battle of Fontenoy-en-Puisaye on 25 June 841. In the following year, the two brothers confirmed their alliance by the celebrated Oaths of Strasbourg. The war was brought to an end by the Treaty of Verdun in August 843. The settlement gave Charles the Bald the kingdom of the West Franks, which he had been up till then governing and which practically corresponded with what is now France, as far as the Meuse, the Saône, and the Rhône, with the addition of the Spanish March as far as the Ebro. Louis received the eastern part of the Carolingian Empire, known then as East Francia and later as Germany. Lothair retained the imperial title and the kingdom of Italy. He also received the central regions from Flanders through the Rhineland and Burgundy as king of Middle Francia. The first years of Charles's reign, up to the death of Lothair I in 855, were comparatively peaceful. During these years the three brothers continued the system of "confraternal government", meeting repeatedly with one another, at Koblenz (848), at Meerssen (851), and at Attigny (854). In 858, Louis the German, invited by disaffected nobles eager to oust Charles, invaded the West Frankish kingdom. Charles was so unpopular that he was unable to summon an army, and he fled to Burgundy. He was saved only by the support of the bishops, who refused to crown Louis the German king, and by the fidelity of the Welfs, who were related to his mother, Judith. In 860, he in his turn tried to seize the kingdom of his nephew, Charles of Provence, but was repulsed. 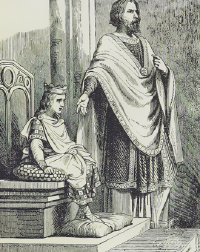 On the death of his nephew Lothair II in 869, Charles tried to seize Lothair's dominions, but by the Treaty of Mersen (870) was compelled to share them with Louis the German. Besides these family disputes, Charles had to struggle against repeated rebellions in Aquitaine and against the Bretons. Led by their chiefs Nomenoë and Erispoë, who defeated the king at the Battle of Ballon (845) and the Battle of Jengland (851), the Bretons were successful in obtaining a de facto independence. Charles also fought against the Vikings, who devastated the country of the north, the valleys of the Seine and Loire, and even up to the borders of Aquitaine. Several times Charles was forced to purchase their retreat at a heavy price. Charles led various expeditions against the invaders and, by the Edict of Pistres of 864, made the army more mobile by providing for a cavalry element, the predecessor of the French chivalry so famous during the next 600 years. By the same edict, he ordered fortified bridges to be put up at all rivers to block the Viking incursions. Two of these bridges at Paris saved the city during its siege of 885–886. In 875, after the death of the Emperor Louis II (son of his half-brother Lothair), Charles the Bald, supported by Pope John VIII, traveled to Italy, receiving the royal crown at Pavia and the imperial insignia in Rome on 29 December. Louis the German, also a candidate for the succession of Louis II, revenged himself by invading and devastating Charles' dominions, and Charles had to return hastily to West Francia. After the death of Louis the German (28 August 876), Charles in his turn attempted to seize Louis's kingdom, but was decisively beaten at Andernach on 8 October 876. It has been suggested that Charles' nickname was used ironically and not descriptively; i.e. that he was not in fact bald, but rather that he was extremely hairy. In support of this idea is the fact that none of his enemies commented on what would be an easy target. However, none of the voluble members of his court comments on his being hairy; and the Genealogy of Frankish Kings, a text from Fontanelle dating from possibly as early as 869, and a text without a trace of irony, names him as Karolus Caluus ("Charles the Bald"). Certainly, by the end of the 10th century, Richier of Reims and Adhemar of Chabannes refer to him in all seriousness as "Charles the Bald". An alternative or additional interpretation is based on Charles' initial lack of a regnum. "Bald" would in this case be a tongue-in-cheek reference to his landlessness, at an age where his brothers already had been sub-kings for some years. Biography*: Louis I, Roi de France also went by the nick-name of Louis 'le Debonaire'. Louis I, Roi de France also went by the nick-name of Louis 'the Pious' (?). 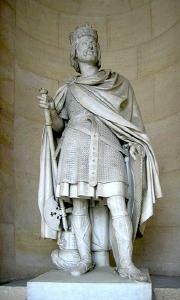 He gained the title of Roi Louis I d'Aquitaine in 781. He was crowned Holy Roman Emperor in 813. He gained the title of Roi Louis I de France (styled as King of the Franks) in 814. 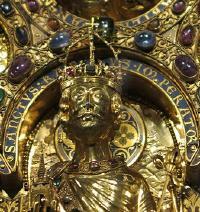 He succeeded to the title of Emperor of the Holy Roman Empire in 814. 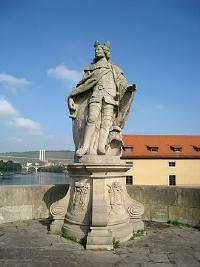 He was crowned Holy Roman Emperor in 816. Louis the Pious (778 – 20 June 840), also called the Fair, and the Debonaire, was the King of Aquitaine from 781. 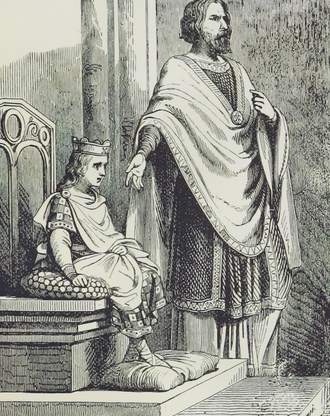 He was also King of the Franks and co-Emperor (as Louis I) with his father, Charlemagne, from 813. As the only surviving adult son of Charlemagne and Hildegard, he became the sole ruler of the Franks after his father's death in 814, a position which he held until his death, save for the period 833–34, during which he was deposed. Louis was born while his father Charlemagne was on campaign in Spain, at the Carolingian villa of Cassinogilum, according to Einhard and the anonymous chronicler called Astronomus; the place is usually identified with Chasseneuil, near Poitiers. He was the third son of Charlemagne by his wife Hildegard. His grandfather was Pepin the Short. Louis was crowned King of Aquitaine as a child in 781 and sent there with regents and a court. Charlemagne constituted the sub-kingdom in order to secure the border of his kingdom after the destructive war against the Aquitanians and Basques under Waifer (capitulated c. 768) and later Hunald II, which culminated in the disastrous Battle of Roncesvalles (778). Charlemagne wanted his son Louis to grow up in the area where he was to reign. However, in 785, wary of the customs his son may have been taking in Aquitaine, Charlemagne sent for him to Aquitaine and Louis presented himself at the Royal Council of Paderborn dressed up in Basque costumes along with other youths in the same garment, which may have made a good impression in Toulouse, since the Basques of Vasconia were a mainstay of the Aquitanian army. In 794, Charlemagne settled four former Gallo-Roman villas on Louis, in the thought that he would take in each in turn as winter residence: Doué-la-Fontaine in today's Anjou, Ebreuil in Allier, Angeac-Charente, and the disputed Cassinogilum. Charlemagne's intention was to see all his sons brought up as natives of their given territories, wearing the national costume of the region and ruling by the local customs. Thus were the children sent to their respective realms at so young an age. Each kingdom had its importance in keeping some frontier, Louis's was the Spanish March. In 797, Barcelona, the greatest city of the Marca, fell to the Franks when Zeid, its governor, rebelled against Córdoba and, failing, handed it to them. The Umayyad authority recaptured it in 799. However, Louis marched the entire army of his kingdom, including Gascons with their duke Sancho I of Gascony, Provençals under Leibulf, and Goths under Bera, over the Pyrenees and besieged it for two years, wintering there from 800 to 801, when it capitulated. The sons were not given independence from central authority, however, and Charlemagne ingrained in them the concepts of empire and unity by sending them on military expeditions far from their home bases. Louis campaigned in the Italian Mezzogiorno against the Beneventans at least once. Louis was one of Charlemagne's three legitimate sons to survive infancy, including his twin brother, Lothair. According to Frankish custom, Louis had expected to share his inheritance with his brothers, Charles the Younger, King of Neustria, and Pepin, King of Italy. In the Divisio Regnorum of 806, Charlemagne had slated Charles the Younger as his successor as emperor and chief king, ruling over the Frankish heartland of Neustria and Austrasia, while giving Pepin the Iron Crown of Lombardy, which Charlemagne possessed by conquest. To Louis's kingdom of Aquitaine, he added Septimania, Provence, and part of Burgundy. [S746] Wikipedia, online http://Wikipedia.com, https://en.wikipedia.org/wiki/Gisela,_daughter_of_Louis_the_Pious. Biography*: Charlemagne, Emperor of the Holy Roman Empire also went by the nick-name of Charlemagne 'the Great'. He gained the title of King Charlemagne of the Franks in 768. He was crowned Holy Roman Emperor in 800. 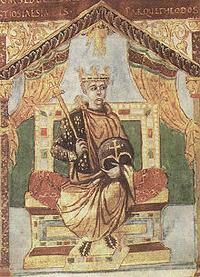 He gained the title of Emperor Charlemagne of the Holy Roman Empire on 25 December 800. Charlemagne (28 January 814), also known as Charles the Great (German: Karl der Große; Latin: Carolus or Karolus Magnus) or Charles I, was the King of the Franks from 768, the King of Italy from 774, and from 800 the first emperor in western Europe since the collapse of the Western Roman Empire three centuries earlier. The expanded Frankish state he founded is called the Carolingian Empire. Called the "Father of Europe" (pater Europae), Charlemagne united most of Western Europe for the first time since the Roman Empire. His rule spurred the Carolingian Renaissance, a period of cultural and intellectual activity within the Catholic Church. Both the French and German monarchies considered their kingdoms to be descendants of Charlemagne's empire. Charlemagne died in 814, having ruled as emperor for just over thirteen years. He was laid to rest in his imperial capital of Aachen in what is today Germany. His son Louis the Pious succeeded him. Biography*: Pepin III, King of the Franks also went by the nick-name of Pepin 'the Short'. He gained the title of King Pepin of the Franks in 751. Pippin the Younger (c. 714 - September 24, 768), often known under the mistranslation Pippin the Short (French, Pépin le Bref; German, Pippin der Kleine), was a King of the Franks from 751 until his death. He was the first of the Carolingians to become King. As King, Pepin embarked on an ambitious program to expand his power. He reformed the legislation of the Franks and continued the ecclesiastical reforms of Boniface. Pepin also intervened in favour of the Papacy of Stephen II against the Lombards in Italy. He was able to secure several cities, which he then gave to the Pope as part of the Donation of Pepin. This formed the legal basis for the Papal States in the Middle Ages. The Byzantines, keen to make good relations with the growing power of the Frankish empire, gave Pepin the title of Patricius. In wars of expansion, Pepin conquered Septimania from the Islamic Ummayads, and subjugated the southern realms by repeatedly defeating Waifer of Aquitaine and his Basque troops, after which the Basque and Aquitanian lords saw no option but to pledge loyalty to the Franks. Pepin was, however, troubled by the relentless revolts of the Saxons and the Bavarians. He campaigned tirelessly in Germany, but the final subjugation of these tribes was left to his successors. Pepin's father Charles Martel died in 741. He divided the rule of the Frankish kingdom between Pepin and his elder brother, Carloman, his surviving sons by his first wife: Carloman became Mayor of the Palace of Austrasia, Pepin became Mayor of the Palace of Neustria. Grifo, Charles's son by his second wife, Swanahild (also known as Swanhilde), demanded a share in the inheritance, but he was imprisoned in a monastery by his two half-brothers. Under the reorganization of Francia by Charles Martel, the dux et princeps Francorum was the commander of the armies of the kingdom, in addition to his administrative duties as mayor of the palace, and specifically commander of the standing guard which Charles Martel had begun maintaining year-round since the Battle of Toulouse in 721. Anointed a first time in 751 in Soissons by the archbishop of Mainz, Pepin added to his power after Pope Stephen II traveled all the way to Paris to anoint him a second time in a lavish ceremony at the Basilica of St Denis in 754, bestowing upon him the additional title of patricius Romanorum (Patrician of the Romans) and is the first recorded crowning of a civil ruler by a Pope. As life expectancies were short in those days, and Pepin wanted family continuity, the Pope also anointed Pepin's sons, Charles (eventually known as Charlemagne) and Carloman. Hard pressed by the Lombards, Pope Zachary welcomed this move by the Franks to end an intolerable condition and lay the constitutional foundations for the exercise of the royal power. The Pope replied that such a state of things is not proper: the de facto power is more important than the de jure power. According to ancient custom, Pepin was then elected King of the Franks by an assembly of Frankish nobles, with a large portion of his army on hand (in case the nobility inclined not to honor the Papal bull). Meanwhile, Grifo continued his rebellion, but was eventually killed in the battle of Saint-Jean-de-Maurienne in 753. Pepin's first major act as king was to go to war against the Lombard king Aistulf, who had expanded into the ducatus Romanus. Victorious, he forced the Lombard king to return property seized from the Church. He confirmed the Papacy in possession of Ravenna and the Pentapolis, the so-called Donation of Pepin, whereby the Papal States were established and the temporal reign of the Papacy began. At about 752, he turned his attention to Septimania. The new king headed south in a military expedition down the Rhone valley and received the submission of eastern Septimania (i.e. Nîmes, Maguelone, Beziers and Agde) after securing count Ansemund´s allegiance. The Frankish king went on to invest Narbonne, the main Umayyad stronghold in Septimania, but didn't manage to capture it from Iberian Muslims until seven years later in 759, when they were driven out to Hispania. However, Aquitaine still remained under Waifer's Basque-Aquitanian rule out of Frankish reach. Waifer appears to have confiscated Church lands, maybe distributing them among his troops. In 760, after conquering the Roussillon to the Muslims and denouncing duke Waifer's actions, Pepin moved his troops over to Toulouse and Albi, ravaged with fire and sword most of Aquitaine, and, in retaliation, counts loyal to Waifer ravaged Burgundy. Pepin, in turn, attacked the Aquitanian-held (urban, non-Frankish 'Romans') Clermont and Bourbon, defended by Waifer's Basque troops, who were overcome, captured and deported into northern France with their children and wives. In 763, Pepin advanced further into the heart of Waifer’s domains and captured major strongholds (Poitiers, Limoges, Angoulême, etc. ), after which Waifer counterattacked and war got bitter. Pepin opted to spread terror, burning villas, destroying vineyards and depopulating monasteries. By 765, the brutal tactics seemed to pay off for the Franks, who destroyed resistance in central Aquitaine (Waifer's capital city Bordeaux fell in 767) and devastated the whole region. As a result, Aquitanian nobles and Basques from beyond the Garonne too saw no option but to accept a pro-Frankish peace treaty (Fronsac, c. 768). Waifer escaped but was assassinated by his own frustrated followers. 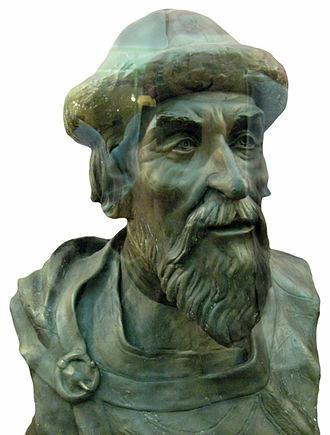 Pepin died during a campaign, in 768 at the age of 54. He was interred in the church of Saint Denis. His wife Bertrada was also interred there in 783. Charlemagne rebuilt the Basilica in honor of his parents and placed markers at the entrance. Historical opinion often seems to regard him as the lesser son and lesser father of two greater men, though a great man in his own right. He continued to build up the heavy cavalry which his father had begun. He maintained the standing army that his father had found necessary to protect the realm and form the core of its full army in wartime. He not only contained the Iberian Muslims as his father had, but drove them out of the country and, as important, he managed to subdue the Aquitanians and the Basques after three generations of on-off clashes, so opening the gate to central and southern Gaul and Muslim Iberia. He continued his father's expansion of the Frankish church (missionary work in Germany and Scandinavia) and the institutional infrastructure (feudalism) that would prove the backbone of medieval Europe. His rule, while not as great as either his father's or son's, was historically important and of great benefit to the Franks as a people. Pepin's assumption of the crown, and the title of Patrician of Rome, were harbingers of his son's imperial coronation which is usually seen as the founding of the Holy Roman Empire. He made the Carolingians de jure what his father had made them de facto — the ruling dynasty of the Franks and the foremost power of Europe. While not known as a great general, he was undefeated during his lifetime. Biography*: He gained the title of King Charles of the Franks. Charles Martel, King of the Franks also went by the nick-name of Charles 'the Hammer'. He fought in the Battle of Tours in 732. Charles Martel (c. 688 – 22 October 741; German: Karl Martell) was a Frankish statesman and military leader who, as Duke and Prince of the Franks and Mayor of the Palace, was de facto ruler of Francia from 718 until his death. The illegitimate son of the Frankish statesman Pepin of Herstal and a noblewoman named Alpaida, Martel successfully asserted his claims to power as successor to his father as the power behind the throne in Frankish politics. Continuing and building on his father's work, he restored centralized government in Francia and began the series of military campaigns that re-established the Franks as the undisputed masters of all Gaul. In foreign wars, Martel subjugated Bavaria, Alemannia, and Frisia, vanquished the pagan Saxons, and halted the Islamic advance into Western Europe at the Battle of Tours. Martel is considered to be the founding figure of the European Middle Ages. Skilled as an administrator and warrior, he is often credited with a seminal role in the development of feudalism and knighthood. Martel was a great patron of Saint Boniface and made the first attempt at reconciliation between the Papacy and the Franks. The Pope wished him to become the defender of the Holy See and offered him the Roman consulship. Martel refused the offer. Biography*: Pepin II (c. 635 – 16 December 714), commonly known as Pepin of Herstal, was a Frankish statesman and military leader who de facto ruled Francia as the Mayor of the Palace from 680 until his death. He took the title, Duke and Prince of the Franks, upon his conquest of all the Frankish realms. The son of the powerful Frankish statesman, Ansegisel, Pepin worked to establish his family, the Pippinids, as the strongest in Francia. He was able to realise his dreams by becoming Mayor of the Palace in Austrasia in 680. Pepin subsequently embarked on several wars to expand his power. He united all the Frankish realms by the conquest of Neustria and Burgundy in 687. In foreign conflicts, Pepin increased the power of the Franks by his subjugation of the Alemanni, the Frisians, and the Franconians. He also began the process of evangelisation of Germany. Pepin's statesmanship was notable for the further diminution of Merovingian royal authority, and for the acceptance of the undisputed right to rule for his family. Therefore, Pepin was able to name as heir, his grandson, Theudoald. But, this was not accepted by his powerful out-of-wedlock son, Charles Martel, leading to a civil war after his death in which the latter emerged victorius. Pepin, sometimes called Pepin II and Pepin the Middle was the grandson and namesake of Pepin I the Elder through the marriage of Pepin I's daughter Begga to Ansegisel, son of Arnulf of Metz. He was also the grandfather of Pepin the Short and great-grandfather of Charlemagne. That marriage united the two houses of the Pippinids and the Arnulfings which created what would be called the Carolingian dynasty. Pepin II was probably born in Herstal (Héristal), modern Belgium (where his centre of power lay), whence his byname (sometimes "of Heristal"). As mayor of Austrasia, Pepin and Martin, the duke of Laon, fought the Neustrian mayor Ebroin, who had designs on all Francia. Ebroin defeated the Austrasians at Lucofao (Bois-du-Fay, near Laon) and came close to uniting all the Franks under his rule; however, he was assassinated in 681, the victim of a combined attack by his numerous enemies. Pepin immediately made peace with his successor, Waratton. However, Waratton's successor, Berthar, and the Neustrian king Theuderic III, who, since 679, was nominal king of all the Franks, made war on Austrasia. The king and his mayor were decisively defeated at the Battle of Tertry (Textrice) in the Vermandois in 687. Berthar and Theuderic withdrew themselves to Paris, where Pepin followed and eventually forced on them a peace treaty with the condition that Berthar leave his office. Pepin was created mayor in all three Frankish kingdoms (Austrasia, Neustria, and Burgundy) and began calling himself Duke and Prince of the Franks (dux et princeps Francorum). In the ensuing quarrels, Berthar killed his mother-in-law Ansfled and fled. His wife Anstrude married Pepin's eldest son Drogo, Duke of Champagne, and Pepin's place in Neustria was secured. Over the next several years, Pepin subdued the Alemanni, Frisians, and Franconians, bringing them within the Frankish sphere of influence. He also began the evangelisation of Germany. In 695, he placed Drogo in the Burgundian mayorship and his other son, Grimoald, in the Neustrian one. Around 670, Pepin had married Plectrude, who had inherited substantial estates in the Moselle region. She was the mother of Drogo of Champagne and Grimoald II, both of whom died before their father. However, Pepin also had a mistress named Alpaida (or Chalpaida) who bore him two more sons: Charles and Childebrand. Biography*: Begga was the daughter of Pepin of Landen, mayor of the palace, and St. Itta. She married Ansegilius, son of St. Arnulf of Metz, and their son was Pepin of Herstal, founder of the Carolingian dynasty of rulers in France. On the death of her husband in the year 691, she built a church and convent at Andenne on the Meuse River and died there. Her feast day is December 17th. 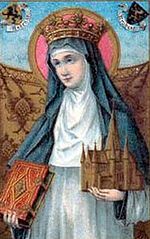 Saint Begga (also Begue, Begge) (615 – 17 December 693) was the daughter of Pepin of Landen, mayor of the palace of Austrasia, and his wife Itta. On the death of her husband, she took the veil, founded seven churches, and built a convent at Andenne on the Meuse River (Andenne sur Meuse) where she spent the rest of her days as abbess. She was buried in Saint Begga's Collegiate Church in Andenne. Some hold that the Beguine movement which came to light in the 12th century was actually founded by St. Begga; and the church in the beguinage of Lier, Belgium, has a statue of St. Begga standing above the inscription: St. Begga, our foundress. Biography*: Pepin of Landen held the office of Mayor of Austrasia. Pepin I (also Peppin, Pipin, or Pippin) of Landen (c. 580 – 27 February 640), also called the Elder or the Old, was the Mayor of the Palace of Austrasia under the Merovingian king Dagobert I from 623 to 629. He was also the mayor for Sigebert III from 639 until his own death. Through the marriage of his daughter Begga to Ansegisel, a son of Arnulf of Metz, the clans of the Pippinids and the Arnulfings were united, giving rise to a family which would eventually rule the Franks as the Carolingians. Pepin's father is named Carloman by the Chronicle of Fredegar, the chief source for his life. His byname comes from his probable birthplace: Landen, modern Belgium. He is sometimes called Pepin I and his other nicknames (Elder and Old) come from his position at the head of the family called the Pippinids after him. He was lord of a great part of Brabant, and governor of Austrasia, when Theodebert II. king of that country was defeated by Theodoric II. king of Burgundy. In 613, several leading magnates of Austrasia and Burgundy abandoned Brunhilda, the great-grandmother and regent of their king, Sigebert II, and turned to Chlothar II of Neustria for support, promising not to rise in defense of the queen-regent and recognizing Chlothar as rightful regent and guardian of the young king. Chief among these leading men were Warnachar II, Rado, Arnulf, and Pepin. The latter two were described by Fredegar as the "two most powerful barons of Austrasia" and they made some agreement with Chlothar at Andernach. However, while Rado was confirmed as mayor in Austrasia and Warnachar in Burgundy, Pepin did not receive his reward until 623, when he was appointed mayor in Austrasia after Chlothar made his young son Dagobert king there. Arnulf, his lifelong friend, was appointed adviser to the new king alongside him. Pepin was praised by his contemporaries for his good government and wise counsel. Though some enemies tried to turn the king against him, their plots were foiled and Pepin remained on good terms with the king until 629, when, for reasons unknown, he retired (or was retired) to his estates, where he remained for the next decade, until Dagobert's death. On his death, Pepin came out of retirement to take on the mayoralty in Austrasia for the heir Sigebert III and to oversee the distribution of the treasury between Sigebert and his brother, Clovis II, and his stepmother Nanthild, who was ruling on Clovis' behalf in Neustria and Burgundy. Sigebert's share of the inheritance was amicably surrendered, partly because of the friendship between Pepin and the Burgundian mayor of the palace, Aega. Pepin and Arnulf's successor as chief counselor to the king, Cunibert, Bishop of Cologne, received the treasure at Compiègne and brought it back to Metz. Not long after, both Pepin and Aega died. He was so popular in Austrasia that, though he was never canonized, he was listed as a saint in some martyrologies. Butler lists him as "blessed". His feast day was 21 February. 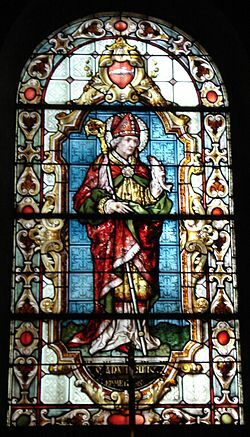 Biography*: Saint Arnulf of Metz (c. 582, Lay-Saint-Christophe, Meurthe-et-Moselle — 640) was a Frankish bishop of Metz and advisor to the Merovingian court of Austrasia, who retired to the Abbey of Remiremont. Arnulf was born to an important Frankish family at an uncertain date around 582. His father was Baudgise or Baudegisel II of Aquitaine (d. 588), Palace Mayor and Duke of Sueve. His mother was Oda. In his younger years he was called to the Merovingian court of king Theudebert II (595-612) of Austrasia and sent to serve as dux at the Schelde. Later he became bishop of Metz. During his career he was attracted to religious life, and he retired to become a monk. After his death he was canonized as a saint. In French he is also known as Arnoul or Arnoulf. In English he is also known as Arnold. Chlothachar later made his son Dagobert I king of Austrasia and he ruled with the help of his adviser Arnulf. Not satisfied with his position as a bishop, he was involved in the 624 murder of Chrodoald, an important leader of the Frankish Agilolfings family and a protégé of Dagobert. Arnulf was married ca 596 to a woman whom later sources give the name of Dode or Doda, (born ca 584), and had children. Chlodulf of Metz was his oldest son, but more important is his second son Ansegisel, who married Begga daughter of Pepin I, Pippin of Landen. Arnulf is thus the male-line grandfather of Pepin of Herstal, great-grandfather of Charles Martel and 3rd great grandfather of Charlemagne. Biography*: Jarislaus I, Grand Duke of Kiev also went by the nick-name of Jarislaus 'the Wise'. He gained the title of Grand Duke Jarislaus I of Kiev in 1019. A son of the Varangian (Viking) Grand Prince Vladimir the Great, he was vice-regent of Novgorod at the time of his father’s death in 1015. Subsequently, his eldest surviving brother, Svyatopolk the Accursed, killed three of his other brothers and seized power in Kiev. 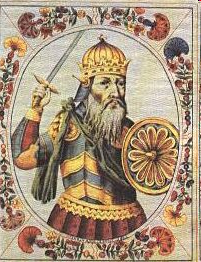 Yaroslav, with the active support of the Novgorodians and the help of Varangian mercenaries, defeated Svyatopolk and became the Grand Prince of Kiev in 1019. Under Yaroslav the codification of legal customs and princely enactments was begun, and this work served as the basis for a law code called the Russkaya Pravda ("Rus Truth [Law]"). During his lengthy reign, Rus' reached the zenith of its cultural flowering and military power. The early years of Yaroslav's life are shrouded in mystery. He was one of the numerous sons of Vladimir the Great, presumably his second by Rogneda of Polotsk, although his actual age (as stated in the Primary Chronicle and corroborated by the examination of his skeleton in the 1930s) would place him among the youngest children of Vladimir. It has been suggested that he was a child begotten out of wedlock after Vladimir's divorce from Rogneda and marriage to Anna Porphyrogeneta, or even that he was a child of Anna Porphyrogeneta herself. Yaroslav figures prominently in the Norse Sagas under the name of Jarisleif the Lame; his legendary fabulosity (probably resulting from an arrow wound) was corroborated by the scientists who examined his remains. In his youth, Yaroslav was sent by his father to rule the northern lands around Rostov but was transferred to Novgorod, as befitted a senior heir to the throne, in 1010. While living there, he founded the town of Yaroslavl (literally, "Yaroslav's") on the Volga. His relations with his father were apparently strained, and grew only worse on the news that Vladimir bequeathed the Kievan throne to his younger son, Boris. In 1014 Yaroslav refused to pay tribute to Kiev and only Vladimir's death prevented a war. During the next four years Yaroslav waged a complicated and bloody war for Kiev against his half-brother Sviatopolk, who was supported by his father-in-law, Duke Boles?aw I Chrobry of Poland. During the course of this struggle, several other brothers (Boris, Gleb, and Svyatoslav) were brutally murdered. The Primary Chronicle accused Svyatopolk of planning those murders, while the Saga of Eymund is often interpreted as recounting the story of Boris's assassination by the Varangians in the service of Yaroslav. Yaroslav defeated Svyatopolk in their first battle, in 1016, and Svyatopolk fled to Poland. But Svyatopolk returned with Polish troops furnished by his father-in-law, seized Kiev and pushed Yaroslav back into Novgorod. Yaroslav at last prevailed over Svyatopolk, and in 1019 firmly established his rule over Kiev. One of his first actions as a grand prince was to confer on the loyal Novgorodians (who had helped him to gain the Kievan throne), numerous freedoms and privileges. Thus, the foundation of the Novgorodian republic was laid. For their part, the Novgorodians respected Yaroslav more than they did other Kievan princes; and the princely residence in their city, next to the marketplace (and where the veche often convened) was named Yaroslavovo Dvorishche ("Yaroslav's Court") after him. It probably was during this period that Yaroslav promulgated the first code of laws in the East Slavic lands, "Yaroslav's Justice" (now better known as Russkaya Pravda, "Rus Truth [Law]"). Leaving aside the legitimacy of Yaroslav's claims to the Kievan throne and his postulated guilt in the murder of his brothers, Nestor the Chronicler and later Russian historians often presented him as a model of virtue, styling him "the Wise". A less appealing side of his personality is revealed by his having imprisoned his youngest brother Sudislav for life. 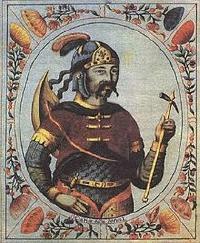 Yet another brother, Mstislav of Tmutarakan, whose distant realm bordered the Northern Caucasus and the Black Sea, hastened to Kiev and, despite reinforcements led by Yaroslav's brother-in-law King Anund Jacob of Sweden (as Jakun - "blind and dressed in a gold suit"), inflicted a heavy defeat on Yaroslav in 1024. Yaroslav and Mstislav then divided Kievan Rus' between them: the area stretching left from the Dnieper, with the capital at Chernihiv, was ceded to Mstislav until his death in 1036. In his foreign policy, Yaroslav relied on the Scandinavian alliance and attempted to weaken the Byzantine influence on Kiev. In 1030, he reconquered Red Rus' from the Poles and concluded an alliance with King Casimir I of Poland, sealed by the latter's marriage to Yaroslav's sister Maria. In another successful military raid the same year, he founded Yuryev (today Tartu, Estonia) (named after Saint George, or "Yury", Yaroslav's patron saint) and forced the surrounding province of Ugaunia to pay annual tribute. In 1043, Yaroslav staged a naval raid against Constantinople led by his son Vladimir and general Vyshata. Although the Rus' navy was defeated, Yaroslav managed to conclude the war with a favourable treaty and prestigious marriage of his son Vsevolod to the emperor's daughter. It has been suggested that the peace was so advantageous because the Kievans had succeeded in taking a key Byzantine possession in Crimea, Chersones. To defend his state from the Pechenegs and other nomadic tribes threatening it from the south he constructed a line of forts, composed of Yuriev, Boguslav, Kaniv, Korsun, and Pereyaslav. To celebrate his decisive victory over the Pechenegs in 1036 (who thereupon never were a threat to Kiev) he sponsored the construction of the Saint Sophia Cathedral in 1037. That same year there were built monasteries of Saint George and Saint Irene. Some mentioned and other celebrated monuments of his reign such as the Golden Gates of Kiev have been perished during the Mongol invasion, but later restored. 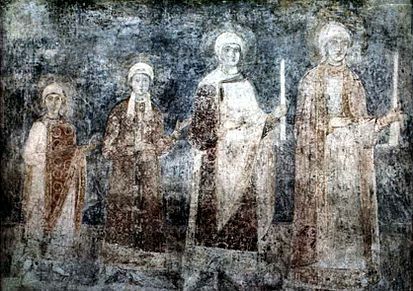 11th-century fresco of the St. Sophia Cathedral in Kiev representing the daughters of Ingegerd and Yaroslav I, with Anna probably being the youngest. Other daughters were Anastasia wife of Andrew I of Hungary, Elizabeth wife of Harald III of Norway, and Agatha wife of Edward the Exile. Biography*: Ingegerd Olofsdotter of Sweden also known as Irene, Anna and St. Anna (1001 – 10 February 1050), was a Swedish princess and a Grand Princess of Kiev. She was the daughter of Swedish King Olof Skötkonung and Estrid of the Obotrites and the consort of Yaroslav I the Wise of Kiev. Ingegerd or St. Anna is often confused with the mother of St. Vladimir “the Enlightener” of the Rus. This is mainly because Ingegerd and Yaroslav also had a son named Vladimir. However, St. Vladimir was actually the father of Ingegerd’s husband Yaroslav I “the Wise”, thus making her St. Vladimir’s daughter-in-law. 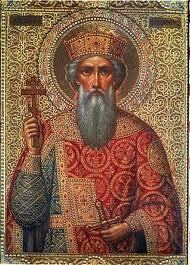 St. Vladimir is actually the son of Sviatoslav and Malusha. Ingegerd was born in Sigtuna, Sweden. She was engaged to be married to Norwegian King Olaf II, but when Sweden and Norway got into a feud, Swedish King Olof Skötkonung would no longer allow for the marriage to take place. Instead, Ingegerd's father quickly arranged for a marriage to the powerful Yaroslav I the Wise of Novgorod. The marriage took place in 1019. Once in Kiev, she changed her name to the Greek Irene. According to several sagas, she was given as a marriage gift Ladoga and adjacent lands, which later received the name Ingria, arguably a corruption of Ingegerd's name. She placed her friend, jarl Ragnvald Ulfsson, to rule in her stead. Ingegerd initiated the building of the Saint Sophia Cathedral in Kiev that was supervised by her husband, who styled himself tsar. She also initiated the Saint Sophia Cathedral in Novgorod. They had six sons and four daughters, the latter of whom became Queens of France, Hungary, Norway, and (arguably) England. The whole family is depicted in one of the frescoes of the Saint Sophia. Ingegerd died on 10 February 1050. Upon her death, Ingegerd was buried in the Saint Sophia Cathedral in Novgorod. Ingegerd was later declared a saint, by the name of St. Anna, in Novgorod and Kiev. The reason was that she initiated the building of the Saint Sophia Cathedral in Kiev as well as the local version, the Saint Sophia Cathedral in Novgorod, along with many good doings. [S746] Wikipedia, online http://Wikipedia.com, http://en.wikipedia.org/wiki/Robert_I,_Count_of_Dreux. Biography*: Vladimir's father was the prince Sviatoslav of the Rurik dynasty. After the death of his father in 972, Vladimir, who was then prince of Novgorod, was forced to flee to Scandinavia in 976 after his brother Yaropolk had murdered his other brother Oleg and conquered Rus. In Sweden with the help from his relative Ladejarl Håkon Sigurdsson, ruler of Norway, assembled a Varangian army and reconquered Novgorod from Yaropolk By 980 Vladimir had consolidated the Kievan realm from modern day Ukraine to the Baltic Sea and had solidified the frontiers against incursions of Bulgarian, Baltic, and Eastern nomads. Originally a pagan, Vladimir converted to Christianity in 988, and proceeded to baptise all of Kievan Rus'. Vladimir, born in 958, was the natural son and youngest son of Sviatoslav I of Kiev by his housekeeper Malusha. Malusha is described in the Norse sagas as a prophetess who lived to the age of 100 and was brought from her cave to the palace to predict the future. Malusha's brother Dobrynya was Vladimir's tutor and most trusted advisor. Hagiographic tradition of dubious authenticity also connects his childhood with the name of his grandmother, Olga Prekrasa, who was Christian and governed the capital during Sviatoslav's frequent military campaigns. Transferring his capital to Pereyaslavets in 969, Sviatoslav designated Vladimir ruler of Novgorod the Great but gave Kiev to his legitimate son Yaropolk. After Sviatoslav's death (972), a fratricidal war erupted (976) between Yaropolk and his younger brother Oleg, ruler of the Drevlians. In 977 Vladimir fled to his kinsman Haakon Sigurdsson, ruler of Norway, collecting as many of the Norse warriors as he could to assist him to recover Novgorod, and on his return the next year marched against Yaropolk. On his way to Kiev he sent ambassadors to Rogvolod (Norse: Ragnvald), prince of Polotsk, to sue for the hand of his daughter Rogneda (Norse: Ragnhild). The high-born princess refused to affiance herself to the son of a bondswoman, but Vladimir attacked Polotsk, slew Rogvolod, and took Ragnhild by force. Polotsk was a key fortress on the way to Kiev, and the capture of Polotsk and Smolensk facilitated the taking of Kiev (978), where he slew Yaropolk by treachery, and was proclaimed knyaz of all Kievan Rus. Vladimir continued to expand his territories beyond his father's extensive domain. In 981, he conquered the Cherven cities (known later as Galicia) shifting his borders toward Poland; in 983, he subdued the Yatvingians, whose territories lay between Lithuania and Poland; in 985, he led a fleet along the central rivers of Kievan Rus' to conquer the Bulgars of the Kama, planting numerous fortresses and colonies on his way. Though Christianity had won many converts since Olga's rule, Vladimir had remained a thoroughgoing pagan, taking eight hundred concubines (besides numerous wives) and erecting pagan statues and shrines to gods. He may have attempted to reform Slavic paganism by establishing the thunder-god, Perun, as a supreme deity. "Although Christianity in Kiev existed before Vladimir’s time, he had remained a pagan, accumulated about seven wives, established temples, and, it is said, taken part in idolatrous rites involving human sacrifice." An open abuse of the deities, to which most people in Rus' bowed in reverence in those times, triggered widespread indignation. A mob killed the Christian Fyodor and his son Ioann (later, after the overall christening of Kievan Rus, people came to regard these two as the first Christian martyrs in Rus and the Orthodox Church set a day to commemorate them, July 25). Immediately after the murder of Fyodor and Ioann, early medieval Rus saw persecutions against Christians, many of whom escaped or concealed their belief. However, Prince Vladimir mused over the incident long after, and not least for political considerations. According to the early Slavic chronicle called Tale of Bygone Years, which describes life in Kyivan Rus' up to the year 1110, he sent his envoys throughout the civilized world to judge at first hand the major religions of the time—Islam, Roman Catholicism, Judaism, and Byzantine Orthodoxy. They were most impressed with their visit to Constantinople, saying, "We knew not whether we were in Heaven or on Earth… We only know that God dwells there among the people, and their service is fairer than the ceremonies of other nations." The Primary Chronicle reports that in the year 987, as the result of a consultation with his boyars, Vladimir sent envoys to study the religions of the various neighboring nations whose representatives had been urging him to embrace their respective faiths. The result is amusingly described by the chronicler Nestor. Of the Muslim Bulgarians of the Volga the envoys reported there is no gladness among them; only sorrow and a great stench. He also said that the Bulgars' religion of Islam was undesirable due to its taboo against alcoholic beverages and pork; Vladimir said on that occasion: "Drinking is the joy of all Rus'. We cannot exist without that pleasure." Ukrainian and Russian sources also describe Vladimir consulting with Jewish envoys (who may or may not have been Khazars), and questioning them about their religion but ultimately rejecting it, saying that their loss of Jerusalem was evidence of their having been abandoned by God. Roman Catholic missionaries came too and so did Orthodox. Ultimately Vladimir settled on Orthodox Christianity. In the churches of the Germans his emissaries saw no beauty; but at Constantinople, where the full festival ritual of the Byzantine Church was set in motion to impress them, they found their ideal: "We no longer knew whether we were in heaven or on earth," they reported, describing a majestic Divine Liturgy in Hagia Sophia, "nor such beauty, and we know not how to tell of it." If Vladimir was impressed by this account of his envoys, he was yet more so by political gains of the Byzantine alliance. In 988, having taken the town of Chersonesos in Crimea, he boldly negotiated for the hand of the emperor Basil II's sister, Anna. Never before had a Byzantine imperial princess, and one "born-in-the-purple" at that, married a barbarian, as matrimonial offers of French kings and German emperors had been peremptorily rejected. In short, to marry the 27-year-old princess off to a pagan Slav seemed impossible. Vladimir, however, was baptized at Cherson, taking the Christian name of Basil out of compliment to his imperial brother-in-law; the sacrament was followed by his wedding with Anna. Returning to Kiev in triumph, he destroyed pagan monuments and established many churches, starting with the splendid Church of the Tithes (989) and monasteries on Mt. Athos. Arab sources, both Muslim and Christian, present a different story of Vladimir's conversion. Yahya of Antioch, al-Rudhrawari, al-Makin, Al-Dimashqi, and ibn al-Athir all give essentially the same account. In 987, Bardas Sclerus and Bardas Phocas revolted against the Byzantine emperor Basil II. Both rebels briefly joined forces, but then Bardas Phocas proclaimed himself emperor on 14 September 987. Basil II turned to the Kievan Rus' for assistance, even though they were considered enemies at that time. Vladimir agreed, in exchange for a marital tie; he also agreed to accept Christianity as his religion and bring his people to the new faith. When the wedding arrangements were settled, Vladimir dispatched 6,000 troops to the Byzantine Empire and they helped to put down the revolt. He then formed a great council out of his boyars, and set his twelve sons over his subject principalities. It is mentioned in the Primary Chronicle that Vladimir founded the city of Belgorod in 991. In 992 he went on a campaign against the Croats, most likely the White Croats (an East Slavic group unrelated to the Croats of Dalmatia) that lived on the border of modern Ukraine. This campaign was cut short by the attacks of the Pechenegs on and around Kiev. In his later years he lived in a relative peace with his other neighbors: Boleslav I of Poland, Stephen I of Hungary, Andrikh the Czech (questionable character mentioned in A Tale of the Bygone Years). After Anna's death, he married again, likely to a granddaughter of Otto the Great. In 1014 his son Yaroslav the Wise stopped paying tribute. Vladimir decided to chastise the insolence of his son, and began gathering troops against Yaroslav. However, Vladimir fell ill, most likely of old age and died at Berestovo, near Kiev. Biography*: He succeeded to the title of Grand Duke Svyatolslav I of Kiev in 945. Sviatoslav I Igorevich (c. 942 – March 972), also spelled Svyatoslav, was a prince of Rus. The son of Igor of Kiev and Olga, Sviatoslav is famous for his incessant campaigns in the east and south, which precipitated the collapse of two great powers of Eastern Europe, Khazaria and the First Bulgarian Empire. He also conquered numerous East Slavic tribes, defeated the Alans and attacked the Volga Bulgars, and at times was allied with the Pechenegs and Magyars. His decade-long reign over the Rus' was marked by rapid expansion into the Volga River valley, the Pontic steppe, and the Balkans. By the end of his short life, Sviatoslav carved out for himself the largest state in Europe, eventually moving his capital in 969 from Kiev (modern-day Ukraine) to Pereyaslavets (modern-day Romania) on the Danube. In contrast with his mother's conversion to Christianity, Sviatoslav remained a staunch pagan all of his life. Due to his abrupt death in ambush, his conquests, for the most part, were not consolidated into a functioning empire, while his failure to establish a stable succession led to a fratricidal feud among his sons, resulting in two of his three sons being killed. Sviatoslav was the first ruler of the Rus' recorded in the Primary Chronicle with a name of Slavic origin (as opposed to his predecessors, whose names derived from Old Norse). This name, however, is not recorded in other medieval Slavic countries. Even in Rus', it was attested only among the members of the house of Rurik, as were the names of Sviatoslav's immediate successors: Vladimir, Yaroslav, and Mstislav. This is questionable, however, as these names follow conventions well established in other Slavic lands, and it ignores Vladimir of Bulgaria, who ruled between 889-893. Some scholars speculate that the name of Sviatoslav, composed of the Slavic roots for "holy" and "glory", was an artificial derivation combining those of his predecessors Oleg and Rurik (they mean "holy" and "glorious" in Old Norse, respectively). On the other hand, such a compound structure name was already known from Great Moravia, as in the rulers named Svatopluk. Clearly Sviatislav's name belongs to this tradition, as he had a son by the name of Yaropolk, of much the same form, and a grandson by the same name, Sviatopolk. Virtually nothing is known about Sviatoslav's childhood and youth, which he spent reigning in Novgorod. Sviatoslav's father, Igor, was killed by the Drevlians around 945, and his mother, Olga, ruled as regent in Kiev until Sviatoslav reached maturity (ca. 963). Sviatoslav was tutored by a Varangian named Asmud (meaning "quick as a leopard"). The tradition of employing Varangian tutors for the sons of ruling princes survived well into the 11th century. Sviatoslav appears to have had little patience for administration. His life was spent with his druzhina (roughly, "troops") in permanent warfare against neighboring states. According to the Primary Chronicle, he carried on his expeditions neither wagons nor kettles, and he boiled no meat, rather cutting off small strips of horseflesh, game, or beef to eat after roasting it on the coals. Nor did he have a tent, rather spreading out a horse-blanket under him and setting his saddle under his head, and all his retinue did likewise. Sviatoslav's appearance has been described very clearly by Leo the Deacon, who himself attended the meeting of Sviatoslav with John I Tzimiskes. Following Deacon's memories, Sviatoslav was a blue-eyed male of average height but of stalwart build, much more sturdy than Tzimiskes. He shaved his blond head and his beard but wore a bushy mustache and a sidelock as a sign of his nobility. He preferred to dress in white, and it was noted that his garments were much cleaner than those of his men, although he had a lot in common with his warriors. He wore a single large gold earring bearing a carbuncle and two pearls. 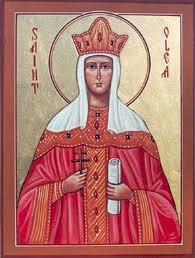 Sviatoslav's mother, Olga, converted to Eastern Orthodox Christianity at the court of Byzantine Emperor Constantine Porphyrogenitus in 957. However, Sviatoslav remained a pagan all of his life. In the treaty of 971 between Sviatoslav and the Byzantine emperor John I Tzimiskes, the Rus' are swearing by Perun and Veles. According to the Primary Chronicle, he believed that his warriors (druzhina) would lose respect for him and mock him if he became a Christian. The allegiance of his warriors was of paramount importance in his conquest of an empire that stretched from the Volga to the Danube. Very little is known of Sviatoslav's family life. It is possible that he was not the only (or the eldest) son of his parents. The Russo-Byzantine treaty of 945 mentions a certain Predslava, Volodislav's wife, as the noblest of the Rus' women after Olga. The fact that Predslava was Oleg's mother is presented by Vasily Tatishchev. He also speculated that Predslava was of a Hungarian nobility. George Vernadsky was among many historians to speculate that Volodislav was Igor's eldest son and heir who died at some point during Olga's regency. Another chronicle told that Oleg (? - 944?) was the eldest son of Igor. At the time of Igor's death, Sviatoslav was still a child, and he was raised by his mother or at her instructions. Her influence, however, did not extend to his religious observance. Biography*: He succeeded to the title of Grand Duke Igor I of Kiev in 924. Igor I (Old East Slavic/Russian: ????? ; Ukrainian: ???? ; Old Norse: Ingvar) was a Varangian ruler of Kievan Rus' from 912 to 945. 6378–6387 (870–879). On his deathbed, Rurik bequeathed his realm to Oleg, who belonged to his kin, and entrusted to Oleg’s hands his son Igor', for he was very young. 6388–6390 (880–882). Oleg set forth, taking with him many warriors from among the Varangians, the Chuds, the Slavs, the Merians and all the Krivichians. He thus arrived with his Krivichians before Smolensk, captured the city, and set up a garrison there. Thence he went on and captured Lyubech, where he also set up a garrison. He then came to the hills of Kiev, and saw how Askold and Dir reigned there. He hid his warriors in the boats, left some others behind, and went forward himself bearing the child Igor'. He thus came to the foot of the Hungarian hill, and after concealing his troops, he sent messengers to Askold and Dir, representing himself as a stranger on his way to Greece on an errand for Oleg and for Igor', the prince’s son, and requesting that they should come forth to greet them as members of their race. Askold and Dir straightway came forth. Then all the soldiery jumped out of the boats, and Oleg said to Askold and Dir, “You are not princes nor even of princely stock, but I am of princely birth.” Igor' was then brought forward, and Oleg announced that he was the son of Rurik. They killed Askold and Dir, and after carrying them to the hill, they buried them there, on the hill now known as Hungarian, where the castle of Ol'ma now stands. He twice besieged Constantinople, in 941 and 944, and in spite of part of his fleet being destroyed by Greek fire, concluded with the Emperor a favourable treaty whose text is preserved in the chronicle. In 913 and 944, the Rus' plundered the Arabs in the Caspian Sea during the Caspian expeditions of the Rus', but it's not clear whether Igor had anything to do with these campaigns. St. Olga was born in c. 890. According to the Primary Chronicle, Olga was born in Pleskov (Pskov) (perhaps in Plisnensk near Lviv), into a family of Varyag origin. By some accounts, she was the daughter of Oleg of Novgorod. Princess Olga was the wife of Igor of Kiev, who was killed by the Drevlians. Upon her husband's death, their son, Svyatoslav, was three years old, making Olga the official ruler of Kievan Rus until he reached adulthood. The Drevlians wanted Olga to marry their Prince Mal, making him the ruler of Kievan Rus, but Olga was determined to remain in power and preserve it for her son. The Drevlians sent twenty of their best men to convince Olga to marry their Prince Mal and give up her rule of Kievan Rus. She had them buried alive. Then she sent word to Prince Mal that she accepts the proposal, but requires their most distinguished men to accompany her on the journey in order for her people to accept the offer of marriage. The Drevlians sent their best men who governed their land. Upon their arrival, she offered them a warm welcome and an invitation to clean up after their long journey in a bathouse. After they entered, she locked the doors and set fire to the building, burning them alive. With the best and wisest men out of the way, she planned to destroy the remaining Drevlians. She invited them to a funeral feast so she could mourn over her husband's grave, where her servants waited on them. After the Drevlians were drunk, Olga's soldiers killed over 5,000 of them. She returned to Kiev and prepared an army to attack the survivors. The Drevlians begged for mercy and offered to pay for their freedom with honey and furs. She asked for three pigeons and three sparrows from each house, since she did not want to burden the villagers any further after the siege. They were happy to comply with such a reasonable request. Olga remained Regent ruler of Kievan Rus with the support of the army and her people. She changed the system of tribute gathering (poliudie) in the first legal reform recorded in Eastern Europe. She continued to evade proposals of marriage, and saved the power of the throne for her son. She was the first Rus' ruler to convert to Christianity, either in 945 or in 957. The ceremonies of her formal reception in Constantinople were minutely described by Emperor Constantine VII in his book De Ceremoniis. Following her baptism she took the Christian name Yelena, after the reigning Empress Helena Lekapena. The Slavonic chronicles add apocryphal details to the account of her baptism, such as the story how she charmed and "outwitted" Constantine and how she spurned his matrimonial proposals. In truth, at the time of her baptism, Olga was an old woman, while Constantine had a wife. Olga was one of the first people of Rus' to be proclaimed a saint, for her efforts to spread the Christian religion in the country. Because of her proselytizing influence, the Orthodox Church calls St. Olga by the honorific Isapóstolos, "Equal to the Apostles". However, she failed to convert Svyatoslav, and it was left to her grandson and pupil Vladimir I to make Christianity the lasting state religion. During her son's prolonged military campaigns, she remained in charge of Kiev, residing in the castle of Vyshgorod together with her grandsons. She died soon after the city's siege by the Pechenegs in 969. Biography*: He gained the title of Prince of Novgorod in 862. Rurik or Riurik (Russian: ???? ?, Old East Norse: Rørik, meaning "famous ruler"; ca 830 – ca 879) was a Varangian chieftain who gained control of Ladoga in 862, built the Holmgard settlement near Novgorod, and founded the Rurik Dynasty which ruled Russia until the 17th century. There is a debate over how Rurik came to control Ladoga and Novgorod. The only information about him is contained in the 12th-century Russian Primary Chronicle, which states that Chuds, Slavs, Merias, Veses and Krivichs "…drove the Varangians back beyond the sea, refused to pay them tribute, and set out to govern themselves". Afterwards the tribes started fighting each other and decided to invite Rurik to reestablish order. Rurik remained in power until his death in 879. His successors (the Rurik Dynasty), however, moved the capital to Kiev and founded the state of Kievan Rus, which persisted until 1240, the time of Mongol invasion. A number of extant princely families are patrilineally descended from Rurik, although the last Rurikid to rule Russia, Vasily IV, died in 1612. There is a large 9th-century funerary barrow in Novgorod Oblast, reminiscent of the mounds at Old Uppsala which is called Shum Gora. Intricately defended against looting, it remains to be excavated. The local inhabitants refer to it as Rurik's Grave. Even though some historians emphasize folklore roots for the Rurik legend and consequently dismiss Rurik as a legendary figure, there is a controversy about his ethnic origins in Eastern Europe. According to the Primary Chronicle Rurik was one of the Rus, a Varangian tribe likened by the chronicler to Danes, Swedes, English and Gotlanders. In the 20th century, archaeologists partly corroborated the chronicle's version of events. It was discovered that the settlement of Ladoga, whose foundation has been ascribed to Rurik, was actually established in the mid-9th century, although doubt is now cast on this by the dendrochronological evidence that Ladoga existed by the mid-8th century. Earthenware, household utensils, and types of buildings from the period of Rurik's foundation correspond to patterns then prevalent in Jutland. 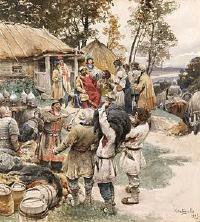 Rurik and his brothers Truvor and Sineus arrive in Ladoga. Some Slavic historians argue that the account of Rurik's invitation was borrowed by a pro-Scandinavian chronicler from a hypothetical Norse document. For instance, the Primary Chronicle states that Rurik arrived to Slavic lands with two brothers, Sineus and Truvor, and sent them to rule the towns of Beloozero and Izborsk, respectively. Instead of connecting Sineus to Signjotr and Truvor to Torvald, they suggest that the chronicler read a hypothetical Scandinavian document and misinterpreted the Norse words 'sine hus' (their houses) and 'tru voring' (with loyal guard) as the names of Rurik's brothers: Sineus and Truvor. Biography*: William III Taillefer (also spelled Tallefer or Tallifer; c.?970 – September 1037) was the Count of Toulouse, Albi, and Quercy from 972 or 978 to his death. He was the first of the Toulousain branch of his family to bear the title marchio, which he inherited (c.975) from Raymond II of Rouergue. His parentage has been subject to reevaluation. He has traditionally been called son of Raymond III Pons and Garsinda. However, recent research has revealed that William was instead son of Adelais of Anjou, known to have married a Raymond, "Prince of Gothia". This discovery has required a complete reevaluation of the succession to the County of Toulouse during this period, and no scholarly consensus has developed. He and his vassals were notorious usurpers of church property. He stole from the abbey of Lézat, but gave it back between 1015 and 1025. Pope John XIX ordered him to stop his vassals from taking the lands of Moissac, a problem later remedied by his successor, Pons, who gave Moissac to Cluny. William became the most powerful prince in western Languedoc and he saw the rise of the House of Capet in France and a corresponding decrease in royal authority recognised in the south. He bore the title of marchio prefatus in pago Tholosano: "prefect margrave in the Toulousain country." His influence extended into the Narbonensis and even Provence, on behalf of his wife. His power did not remain undiminished in his own city of Toulouse, where he was forced by a council of local noblemen and clerics to give up dues imposed on the market there. [S746] Wikipedia, online http://Wikipedia.com, http://en.wikipedia.org/wiki/William_III,_Count_of_Toulouse. Adelaide-Blanche of Anjou (c.?940 –1026) was the countess by marriage of Gévaudan and Forez, of Toulouse, of Provence, and of Burgundy; and queen consort of Aquitaine. She was the daughter of Fulk II, Count of Anjou and Gerberga and sister of Geoffrey Greymantle. She successfully increased Angevin fortunes being married a total of five times. Her family had become upwardly mobile to the point that, as a member of just the third generation from Ingelger, Adelaied-Blanche had married into the highest ranks of the older nobility of western Francia. Her first marriage was to Stephen, the powerful Count of Gévaudan and Forez in eastern Aquitaine. She was no more than fifteen at the time and he was much older, still they had three children who survived to adulthood. Stephen died in the early 960s and after his death she ruled the lands as countess-regent for her sons William, Pons and Bertrand. She continued to govern Gevaudan and Forez while her remaining two sons learned to rule their father's counties. Additionally, after her oldest son William's death in 975 she raised his infant son Stephen. Her brother Guy (a.k.a. Guido II) was made Count-Bishop of le Puy in 975 amidst local opposition and at his request Adelaide, acting for her sons Guy and Bertrand, led an army to aid him in establishing the "Peace of God" in le Puy. In 982, as the widow of her second husband, Raymond III, count of Toulouse, she wed Louis V of France, son of Lothair of France. 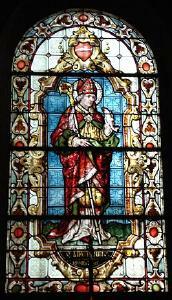 The two were crowned King and Queen of Aquitaine at Brioude by her brother Bishop Guy of le Puy. But the marriage lasted just over a year due to the couple being unable to peacefully live together. There was also a significant age difference—he being just fifteen and Adelaide-Blanche being over forty. Adelaide found herself in a precarious situation with king Lothair but was rescued by Count William I of Provence who she subsequently married in c.?984. Count William of Provence died in 994 shortly after becoming a monk at Avignon. In 1010 king Robert II of France along with Odo II, Count of Blois went to Rome to secure an annulment from Robert's second wife, Constance of Arles, Adelaide-Blanche's daughter by William I. Pope Sergius IV, a friend to the Angevin counts, upheld the marriage and additionally upheld Adelaide's struggle to maintain control of lands at Montmajour Abbey. These lands, at Perth, had been donated by Count William I of Provence with his wife Adelaide-Blanche, as well as by a previous donation by William's father, Boson. A dispute over these lands arose by four brothers, sons of Nevolongus, who pope Sergius threatened with excommunication if they did not withdraw their claim. The claim was withdrawn and the lands remained under the control of Adelaide-Blanche acting as regent for her son William II of Provence. The cloister of Montmajour Abbey her final resting place.